There may be two new films hitting theaters this weekend, but let's face it, only one really matters. One of the largest grossing series in box office history hits its final stretch starting Friday. On the Mount Rushmore of movie franchises, Harry Potter is the Teddy Roosevelt. Or maybe the Jefferson, I'm not sure exactly how this works. Point is, it's a big giant head carved into a mountain. I may have lost my metaphor here along the way. Through the previous six films, it's made $1.7 billion in North America and $5.4 billion worldwide (which, for perspective, is approximately the GDP of Moldova). Add in several billion more in DVD sales, rental income and cable broadcast rights, and we're talking about one of the biggest juggernauts of all time, and a series that's made Warner Bros. a majestic pile of cash. 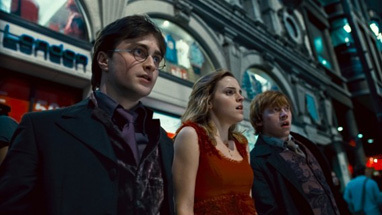 So much so that Warner simply couldn't say goodbye so quickly, and split the seventh book, And The Deathly Hallows, into two movies, the first of which debuts at midnight Friday.